Toronto has really become a truly international city, the diverse ethnic population provide great opertunities to experience food from many different cultures. Let’s face it, we’re privileged. 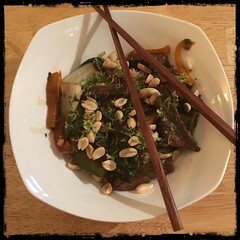 This recipe particular recipe has been inspired by some of the Vietnamese and Thai food we had tried over the years. 1. Marinate the beef strips for about 30-60 minutes, remove from marinade and let drain. Don’t forget to save the marinade! 2. In a large wok or skillet, preheat 2 tbsp of avocado oil and 2 tbsp coconut oil. Fry the the onions and garlic. 3. When the onions begin to show signs of transparency and the garlic begins to soften toss in the slivered ginger, let cook for a a few minutes. 4. Toss in the beef, mix well. 5. Once the beef is browned, toss in the peppers. 6. As the peppers begin to soften, add the marinade and let it return to a simmer. 7. Once simmering, toss in the bok choy, mix well and cover. 8. After 3-5 minutes, or when the bok choy is done to your liking, toss in a bunch of cilantro. 9. Serve over rice or noodles and garnish with lime zest and peanuts.